6th Annual Venice Community Picnic This Saturday! - Yo! Venice! Home Venice Beach Events Kids Events 6th Annual Venice Community Picnic This Saturday! 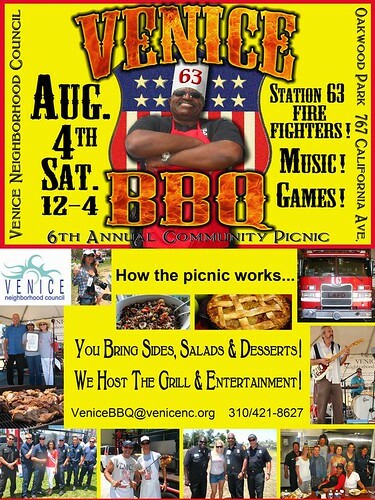 6th Annual Venice Community Picnic This Saturday! (Re-posting this as a reminder!) The 6th Annual Venice Neighborhood Council community picnic will be held at Oakwood Park on Saturday, August 4th from 12-4pm. The VNC and Fire Station 63 provide the BBQ and entertainment, residents are asked to bring sides, salads and desserts.